The goal of management of patients with renal injuries is to minimize morbidity and to preserve renal function. Thus, renal exploration should be undertaken selectively. The condition of the patient remains the absolute determinant in the decision for initial observation vs surgical intervention. However, the management of renal injury is usually influenced by the decision to explore or observe associated abdominal injuries (Krist-jansson 1993; Husmann 1993). Nonoperative therapy is supported widely for the majority of blunt and penetrating injuries. The grade of renal injury, the overall injury severity of the patient, and the requirement for blood transfusions are the primary prognostic factors for nephrectomy and overall outcome (Kuo et al. 2002). A life-threatening hemodynamic instability due to renal hemorrhage is an absolute indication for renal exploration, irrespective of the mode of injury (McA-ninch et al. 1991; Armenakas et al. 1999). In exsanguinated patients with severe hypovolemia, an endovascu-lar aortic balloon catheter may control renal bleeding prior to laparotomy (Long 2004). Other indications for exploration include an expanding or pulsatile perirenal hematoma identified at exploratory laparotomy performed for associated injuries (this finding heralds a Grade 5 vascular injury and is quite rare). A one-shot, intraoperative IVP can provide valuable information. Poor visualization or any other abnormality of the injured kidney is an indication for exploration. Grade 5 vascular renal injuries are by definition regarded as an absolute indication for exploration; however, a single report suggesting that patients who are hemodynamically stable at presentation, but with a Grade 5 parenchymal injury (shattered kidney) after blunt trauma might be safely treated conservatively (Altman et al. 2000). More research on this rare entity is required before definitive recommendations are given, and each patient must be treated individually for the best outcomes. 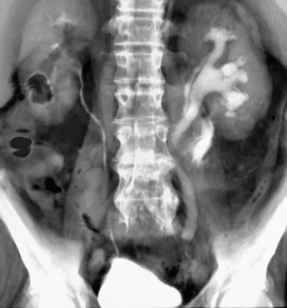 The management of major renal injuries with urinary extravasation and devitalized fragments is controversial. Since these injuries are very uncommon, published series report on small numbers of patients. In recent years, it seems as though it has been recognized that most major injuries heal with nonoperative treatment (Matthews et al. 1997). Moudouni et al. suggest that an initial conservative approach is feasible in stable patients with devitalized fragments (Moudouni et al. 2001a, b). These injuries, however, are associated with an increased rate of complications and late surgery (Husmann and Morris 1990). Persistent extravasation or urinoma are usually managed successfully with endourological techniques. Inconclusive renal imaging and a preexisting renal ab normality or an incidentally diagnosed tumor may require surgery even after relatively minor renal injury (Bahloul et al. 1997; Schmidlin et al. 1998b).